The convoy of Iranian ships suspected of carrying arms for the Huthis in Yemen was reported parked south-southeast of the Yemeni border with Oman in the north Arabian Sea, NBC quoted U.S. officials as saying on Wednesday morning. Saudi and Egyptian warships were positioned to the southwest of the convoy, forming a blockade of the Gulf of Aden and the port city of Aden. U.S. aircraft carrier the USS Theodore Roosevelt and the guided missile cruiser Normandy arrived in the Arabian Sea on Monday to join six other U.S. ships in the area. They could also intercept any ships carrying arms to Yemen. The intentions and the ultimate destination of the Iranian convoy, comprised of seven vessels including freighters and small IRGCN warships, were not known. Two Iranian Navy ships, the frigate Alborz and replenishment ship Bushehr were also in the area. I'm not sure what the convoy was going to to do in case the airstrikes weren't suspended but it's becoming increasingly clear that the military build-up of Iranian naval forces at the Gulf of Aden and Arabian Sea has radically changed Saudi Arabia's calculations. Two ships are already at the Gulf of Aden and seven more are on their way. Only one reason for that. I wonder if the Iranians were really going to break through the blockade and start a major military showdown in case the airstrikes weren't suspended. Indeed! The modestly armed Persian flotilla nearing the Yemeni port has changed the calculation back in the house of Saud. It's nice to see the Arabs still remember how the Persians are capable of dominating the region as they have for thousands of years, and most recently during the Safavid dynasty. As far as attempting to break the blockade, I don't know if they will try that...Iran is wise enough to fight on it's own terms, and in it's time of choosing, when it's not vastly outgunned. I suspect that this whole convoy sending thing was meant to see who would blink first. The Iranians won't take it so far as to risk losing their ships where the odds are heavily against them. A more credible option, and probably the only one left, is to re-route weapons/munitions and cash through Oman. Yemen's border with Oman is very porous, making it easy to trespass. However it would be interesting to see what the Iranians would do incase the GCC-coalition troops decide to invade Yemen. Having said all that, i echo the sentiments of Nader in regards to the possiblity of a ceasfire. This conflict can only be settled through negotiations amongst the internal factions. There's no clear cut military solution. Continued military actions only serve to delay the inevitable. To begin with, GCC should end its bombing campaign and refrain from sending in its army and Iran should stop sending arms and cash. First of all, Egypt, Saudi, and GCC don't have a blue water navy. nor do they have (Anti Ship Missile capability) like the Iranians, these tiny client state nations can't own and possess such weapons Gulf Arabs are to stupid to operate Submarines and torpedo's, which is the mane reason why, Iran can break through their weak blockade with ease! 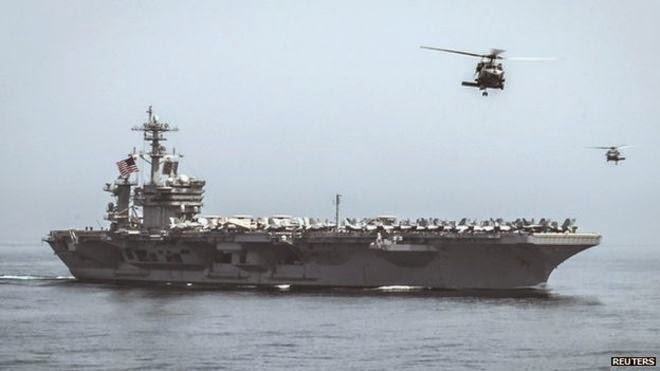 The American Carrier Battle Group is strong and capable, but it is also afraid of Iran's powerful show of force, and is keeping its distance from the Iranian (ASM) and Mini Submarine hoot Missiles, Imagine a shooting war? The American Surface ships will be the first ones to incur casualties and sink! Iranian (Anti ship missile capability) make American surface ships obsolete! Iran is using a combination of hard power and soft power. Iranian (Intelligence, surveillance, reconnaissance, radar) has American Carrier battle group under surveillance. make no mistake the Iranians run the show! and are the new sheriffs in town! I'm sorry but i sense alot of make belief in your comment Anon 10:29. Frankly your reasoning can't be taken seriously. Let's be realistic here. GCC/US-coalition has air supremacy and they have naval superiority (they both outnumber the Iranian fleet as well as have the technological edge), whereas Iran's airforce is really a non-factor in a potential battle scenario in the Gulf of Aden and the Arabian sea. PM, what's clear is that the Iranians aren't gonna even try to challenge the blockade. Iran will go back to trying to sneak arms into foreign countries, it's usual course of action. while Anon 10:29's remarks were partly out of line and more related to Arab bashing than objective analysis, your view of the current balance of power existing between the GCC and Iran in turn is highly exaggerated if not delusional, and do not take into account the larger strategic picture to assess a direct confrontation between GCC member states and Iran, and articulate your prediction as if a shooting war would be limited to two air-forces going against each other in a vacuum, which is flawed at its core. Indeed, Iran's ballistic strike capability will have drastic consequences on neighboring states' ability to make use of their air force effectively, to quote only that. Even the Pentagon repeatedly assessed that a determined Iranian strike on infrastructure located within direct vicinity of its SRBMs and IRBMs (which in total constitutes literally thousands of assets with enough precision to cripple major critical infrastructure on a large industrial target such as an air-base) will prevent the GCC from relying on the full potential of its air-force by a large margin in the opening hours/days of a war. The KSA and Qatar alike will have a hard time copping with continuous ballistic strikes slamming on major runways, control towers, aircraft shelters, fuel depots, barracks and other logistical targets in the few concentrated airbases used to house the GCC F-15 and F-16. This and Iran's known ability to perform massed stand-off strikes via their many operational F-4s, modified F-14s and Su-24 now fielding C-802/803 derivatives of their own produced by the DIO. On the other hand , the GCC's air forces ability to penetrate deep into Iranian airspace and handle both its many integrated, layered air-defenses and air-defense squadrons backed by GCI is yet to be proven. I'd rather say that based on the aforementioned elements, the GCC's sole technological edge and US ABM systems deployed in limited numbers and so far unproven in shielding critical assets against dozens of simultaneous missiles falling at hyper-sonic speed, as well as its US-supplied and supported aviation assets, are both non-factors when it comes to total war with Iran. Some planes will hit targets in Iran, and some missiles on the Iranian side will certainly miss their targets or get intercepted. But on the long run, all estimates I've had the opportunity to read so far discard such a swift GCC victory that you seem to be implying here. Iran currently wins the attrition game against any combination of forces of the GCC, considering Egypt is too far away to take part in any credible way, and Pakistan will never go at Iran simply on the orders from the House of Saud no matter what. They didn't do it against Houthis, I don't see them green-lighting it against none other than Iran, that would be utter absurdity to expect that. claiming that the US is " afraid of Iran's powerful show of force" is downright delusional if not plain stupid. Iran's military has no chance of surviving any real fight with the US Navy. whatever can you be thinking???? https://www.youtube.com/watch?v=LhqLn1wKJAw --- The largest aircraft carrier in the world. https://www.youtube.com/watch?v=NhDouNPf9c8 --- Aircraft carriers history.